Working to make Missouri a better, safer place to walk and bicycle! AND Bicycle Ride with Legislators! We need YOU to help us advocate for the Rock Island Trail, bike/ped safety, and more . . .
Want better bicycling and walking in Missouri? We rely on the support of members like you. Please join, renew, or donate today. Other ways you can help . . .
Help us grow . . .
What has MoBikefed done for YOU? All MoBikeFed members have a login account. Bicycle Missouri License Plate now available! Show your love of cycling - on your car or truck. 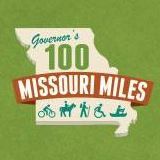 Join the Governor's 100 Missouri Miles Challenge! Making Missouri a better, safer place for bicycling, walking, and trails. Missouri Bicycle & Pedestrian Federation, Inc. Note: Our PO Box in Jefferson City is no longer active. Please use the 2208 Missouri Blvd, Ste. 102 #200 address instead.